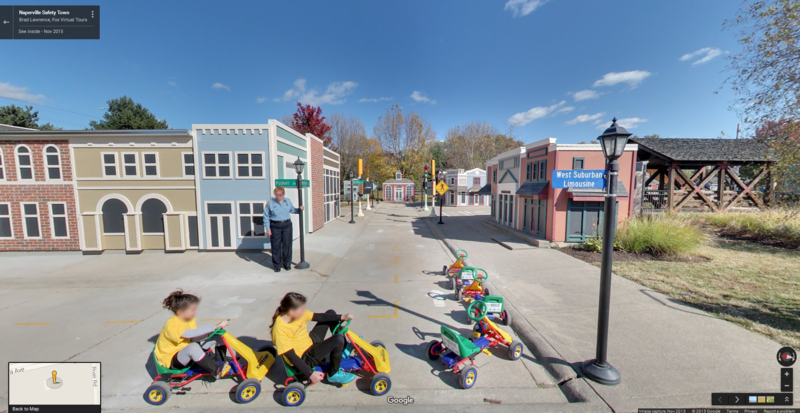 Fox Virtual Tours has partnered with the Naperville Safety Town Commission to create a new Google Street View virtual tour of Naperville Safety Town. The Safety Town program was first introduced to Naperville in 1978 by the Naperville Junior Woman’s Club, which oversees its operation. After years of temporary locations, the permanent Naperville Safety Town was opened in 1996. It includes a classroom building as well as a kid-sized town complete with buildings, streets, a fire safety house, railroad crossing and traffic signs and signals. Naperville Safety Town was recently re-dedicated in honor of retiring Naperville Mayor George Pradel and his late wife, Patricia. Before he was mayor, George Pradel was “Officer Friendly” to countless Naperville school children. As mayor, he was instrumental in bringing the National Safety Town program to Naperville. Now named the “George and Patricia Pradel Safety Town of Naperville,” Safety Town recently underwent extensive renovations including painting and repairs of the little wooden buildings. In the new “Tiny” Street View virtual tour, viewers can explore all of Safety Town, including the classroom, town, “Smoke House,” railroad tracks, and residential neighborhood. Many buildings in the town represent actual buildings in Naperville, including a bridge like the ones along the Naperville Riverwalk. One of the highlights of the tour is the aptly-named “Smoke House,” where children learn about fire safety. The Smoke House features a concert-type special effect which pumps simulated smoke into the bedroom. In the tour, we can see a firefighter helping the girls escape through an open window. Google Street View virtual tours are a perfect way to showcase museums, parks, theaters, galleries, hotels, restaurants, pubs, salons, spas, shops, and many other locations. Fox Virtual Tours is proud to be a leading provider of Google Street View | Trusted virtual tours serving Chicagoland and beyond. Contact me for a free quote on a Street View virtual tour of your business. Fox Virtual Tours and Full Armor Studios have partnered to create two new virtual tours of the charming Blackberry Farm Historical Village in Aurora. In the new Google Street View virtual tour, viewers can fully explore this picturesque park to “See inside” the One Room Schoolhouse, Blacksmith’s Shop, Weaver’s Cabin, Potter’s Barn, Pony Rides, Covered Bridge, Train Depot, Adventure Playground, Discovery Barn and more. Users can even “ride” the Carousel and traverse the mysterious railroad tunnel to see what’s on the other side. Operated by the Fox Valley Park District, Blackberry Farm is a popular family destination and venue for weddings, reunions, and corporate outings. Click the links below to “See Inside” Blackberry Farm Historical Village! Google Street View virtual tours are an engaging and effective way to showcase both indoor and outdoor locations, including park district venues, restaurants, pubs, boutique shops, salons, fitness centers, museums, galleries and theaters. Contact us for information about a Street View virtual tour of your location. Congratulations to the West Michigan Whitecaps for winning the Midwest League Championship with a thrilling 3-2 series win over the Cedar Rapids Kernels. The Whitecaps, based in Comstock Park just north of Grand Rapids, Michigan, recently became the second Midwest League team (after the Kane County Cougars of Geneva, Illinois) to showcase their ballpark with a Google Street View virtual tour from Fox Virtual Tours. The Whitecaps, a Class A affiliate of the Detroit Tigers, play in the state-of-the-art Fifth Third Ballpark with a capacity of nearly 10,000. The new virtual tour will let fans “See inside” the ballpark with Google’s cutting-edge Street View technology. Fans can see panoramic views all around the ballpark including the main concourse, seating bowl, infield views, outfield party decks, and Club Level suites and balcony views. Fans can even discover “Easter egg” views such as mascot Crash the River Rascal at bat (his friend Roxy at umpire), Crash and Roxy playing on the home dugout or in the stands, and the hidden view behind the scoreboard. Pitcher’s Mound — Now Here’s Come the Delivery! The new ballpark virtual tour was published under the Google Street View | Trusted program and offers several benefits for the Whitecaps. First, the virtual tour showcases the ballpark and engages new fans on Google properties such as Google Maps, Maps for Mobile, Search and Google+ Local. Second, the virtual tour gives the Whitecaps a powerful tool to showcase hospitality areas such as suites and party decks, as well as views around the seating bowl. And third, the Whitecaps can embed the virtual tour on their website and post it in social media to engage and interest fans in coming to the ballpark. Google Street View is a powerful and affordable technology for showcasing businesses and venues of all types. Please feel free to contact Brad at Fox Virtual Tours for more information or to schedule a photo shoot.